Autumn is my favourite time of the year, predominantly because of the warm colours and the rich tones that are all around us. I automatically think of trees at this time of year because they really come into their own and dominate the landscape. On a sunny day, you can’t beat the light effect when the sun shines through leaves that have turned a gorgeous Autumn colour. Choosing trees can be quite challenging, especially for gardens where space is an issue. Small gardens may only allow space for one specimen tree and the choice you make therefore becomes even more important. 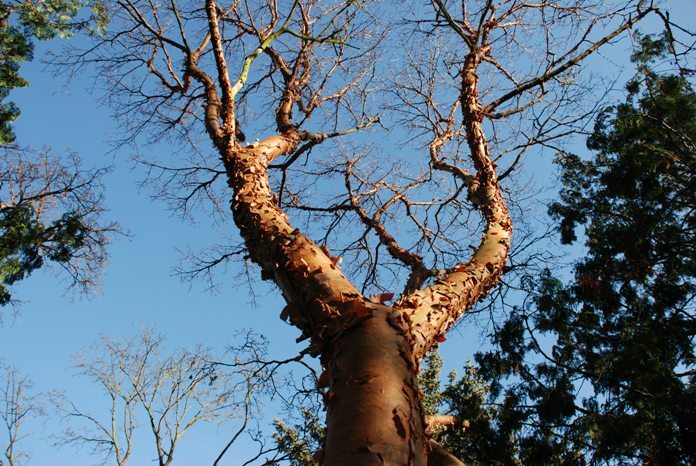 It should work hard for its place, look good all year round, even if it does lose its leaves in the Winter, and ideally it should provide interest for at least 2-3 seasons of the year. Most Acers have spectacular Autumn colour and also provide a display of beautiful foliage during the Spring and Summer months too. Acer griseum, the Paperbark Maple (see below), has wonderful glowing red, orange and scarlet leaves in the Autumn, but the magic really happens in the Winter then it reveals its shiny, peeling copper coloured bark that lights up with the slightest glimpse of sunlight. Amelanchier lamarckii (below) is another really useful tree for a small garden. In Spring its elegant branches are scattered with loose clusters of starry white flowers and copper red unfurling leaves, then in the Autumn, the leaves turn a gorgeous pinky-orange. 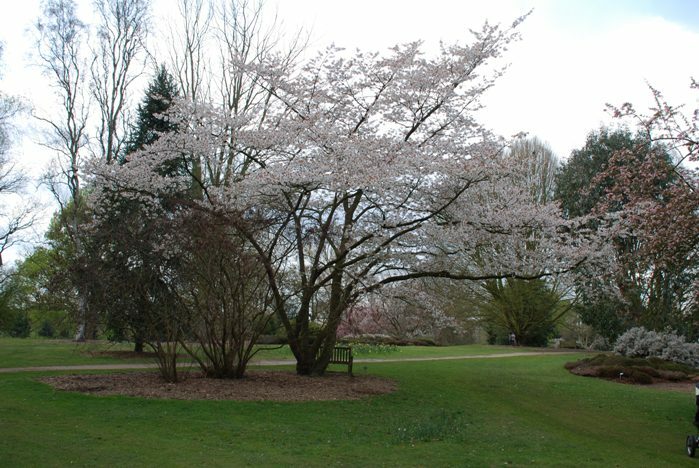 Cornus florida f. rubra is probably the finest flowering Dogwood – it makes a conical tree and has superb pink blossoms in early Summer and rich Autumn foliage. Requires neutral to acid soil. Pyrus salicifolia ‘Pendula’ (Silver Weeping Pear) – has silvery, light, willow-like foliage and a graceful habit. Although small in height, it can take up space, but pruning can control this. Robinia x slavinii ‘Hillieri’ is a gorgeous tree with pink wisteria-like flowers in Summer and soft green foliage. It’s a great choice for a small garden because it produces results quickly, but the branches are quite brittle and it must therefore be planted in a sheltered spot. Like many of the Sorbus varieties, Sorbus cashmiriana is a great choice for a small garden. It rarely reaches more than 3-4 metres and has an open habit and pink flowers in Spring which are followed by white berries that remain on the tree long after the leaves have gone. There are many more trees for small spaces of course, but I hope this has given you a selection of some of the best. Feel free to add some more if you wish and remember to always consider the soil, aspect and drainage of the site before you make your final choice! Great choices, – I love Amelanchier. – But don’t forget the edibles, – loads of Malus and Prunus are very ornamental as well as giving apple, plums and damsons. You’re so right, Claire! Some of the prunus have gorgeous bark too which looks fabulous in Winter when the sun catches it.